Lydia is a bookseller at the Bright Ideas Bookstore. A large, independent bookstore in Denver, CO, it is the home for a number of quirky employees and for a number of regular patrons, the BookFrogs as the employees call them. One night a young member of the BookFrogs, Joey, hangs himself on the third floor during Lydia’s shift. This tragedy starts Lydia on an arc of discovery, about Joey, about herself, and about the night twenty years earlier that changed her life forever. First, this is just a cool book. The characters are fun, the dialog is fresh, and the story feels real. Lydia’s journey is authentic. She is a young woman who survived a brutal event, an event that cost her almost everything dear to her. This has left scars that cannot be hidden, though hide them she tries: a new name, a refusal to discuss her past, complete disconnection from her father. But Joey’s death draws her reluctantly down a path of rediscovery and reconnection with that past. Old faces return to her life in new ways. In unraveling the threads of Joey’s life, she begins reweaving threads of her own. Matthew Sullivan makes Lydia a heroine that we can cheer for. She is broken, but her response to the brokenness is hopeful and empowering. For an adult with fond memories of his childhood in Denver, this book is delightful. Colfax Avenue could almost be a character in the book. America’s longest street, Colfax winds through the neighborhoods of Denver carrying traffic to every kind of business. Sullivan takes his readers through some of these neighborhoods. The LoDo of the book is a real place. 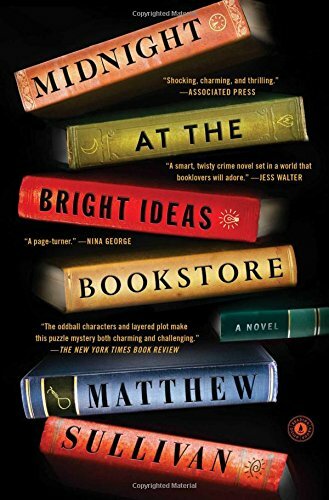 The Bright Ideas bookstore itself is a thinly veiled homage to the venerable Tattered Cover Bookstore, one of the best bookstores in America! (No hometown bias in this review!) Sullivan knows Denver–he used to work at the Tattered Cover–and his love for the city is apparent throughout. Midnight at the Bright Ideas Bookstore is a solid book. It is a mystery, but it is not bogged down in procedural drama that so often marks the genre. Instead, the mystery of Lydia’s self-discovery, her journey toward finding her own answers about her own life, guides the reader through the streets of Denver into the life of a special young woman.